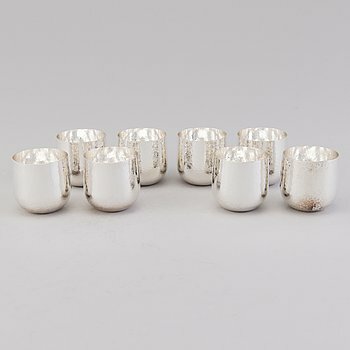 The Silver category offers a wide assortment of high-quality silver, from the 17th century to classic silver objects by well-known Scandinavian designers such as Georg Jensen and Taipo Wirkkala. 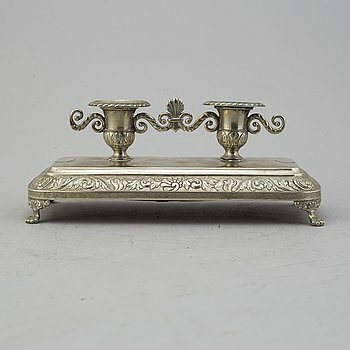 Candlesticks, plates, cutlery and other attractive everyday items, as well as historical prestige items and small personal accessories such as snuff boxes and cigarette cases. From silver-rich ores, the metal has been extracted for centuries, silver has been used for adornments for at least 6000 years. 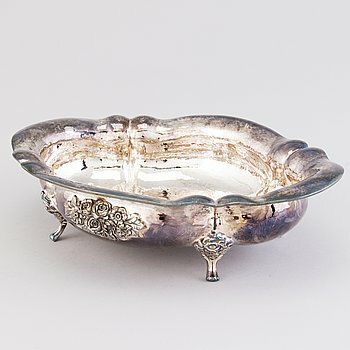 Despite its long history, silver items are timeless and if you take good care of your objects, they will stay as beautiful as they were when they were newly produced, as this category shows. Showing all 93 items matching your search criteria. 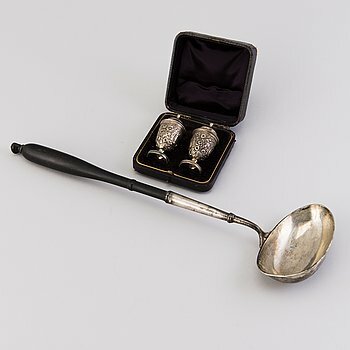 TH MARTINSEN, 48 psc silver cutlery, model 'Lillemor'. Norway, 20th century. Lenght 8,5-18 cm Weight including blades in stainless steel 1585 grams. 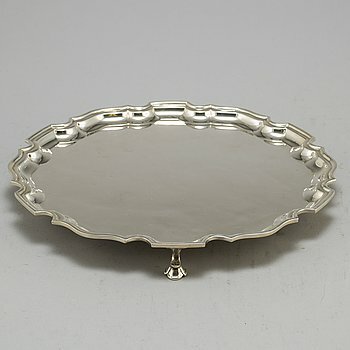 TIFFANY & CO, tray, sterling silver, marked Tiffany&Co and numbered 24071. Diameter 31 cm. Weight 870 g.
A Russian early 19th century pacel-gilt silver salt-cellar, unidentified makers mark, St. Petersburg. Length 8 cm, height 10 cm, weight 72 grams. 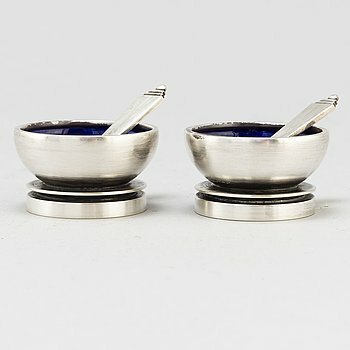 HARALD NIELSEN, a pair of silver and enamel salt cellars for Georg Jensen, Denmark 1945-51. Diameter 4 cm, height 2,5 cm. 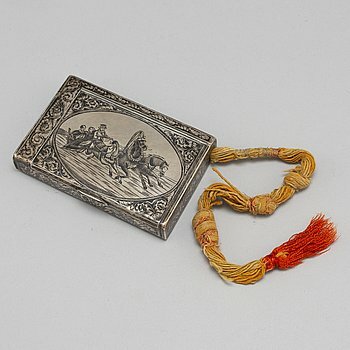 Total weight ca 77 g.
A Russian 19th century parcel-gilt and niello cigarette case, makers mark APC, Moscow 1899-1908. Pull-out tassel and compartment for matchbook. Measurements 10,5 x 7 x 2,5 cm. Weight 192 grams. A Russian mid 19th century silver-gilt and niello snuff-box, mark of Moscow. Length 8,5 cm, width 5,5 cm, weight 94 grams. 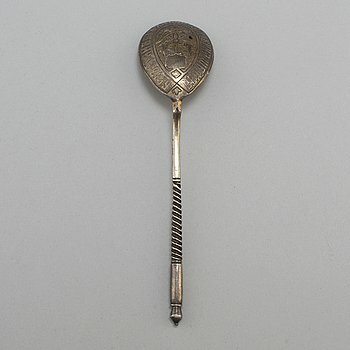 A Russian 19th century silver-gilt spoon, mark of Stepan Kusmitsch Lewin (probably), Moscow 1877. Length 16 cm, weight 30 grams. 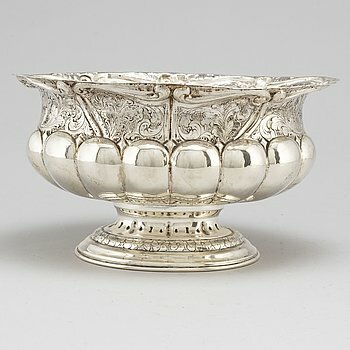 An end of the 19th Century 800 silver bowl. 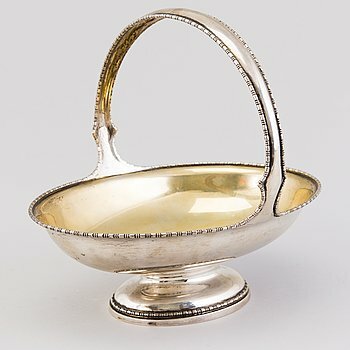 A silver basket, mark of Ferdinand Timper, Helsinki 1903. Width handles include 38.5 cm. 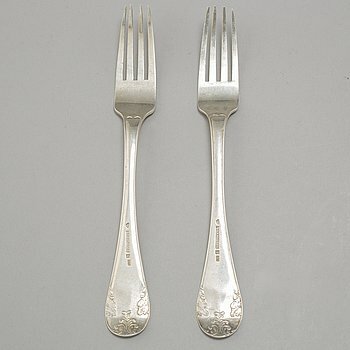 Weight circa 520 g.
A set of twelve silver oyster forks, mark of Emile Puiforcat, Paris, around the turn of the 20th Century. Length 13,8 cm. In lined box. 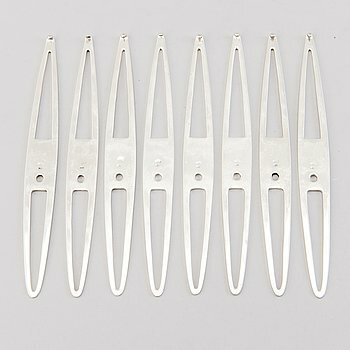 Weight 301 g.
A set of 8 sterling silver crayfish needles by MIU, 20th Century. Length 14 cm. 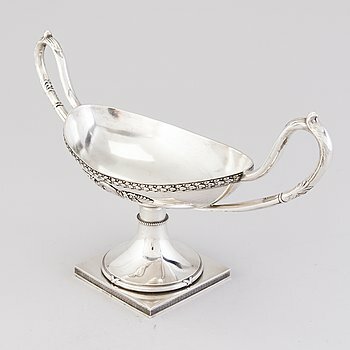 Weight 121.8 g.
A French silver and silver plated lamb bone holder from the end of the 19th Century/early 20th Century. 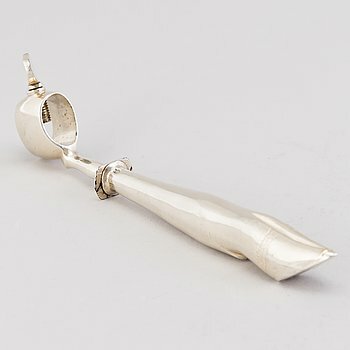 Cloven shape silver handle, top in silver plated metal. Length 19 cm. 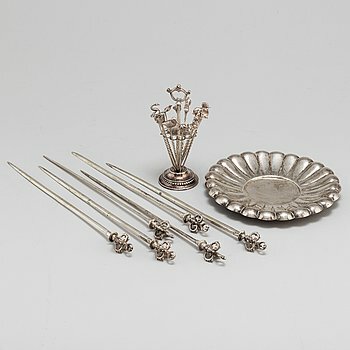 A set of six sterling silver lobster forks, Bremer Silberwarenfabrik, Germany first half of the 20th Century. Length 19.5 cm. 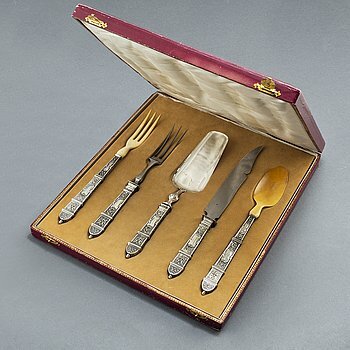 Paino 175 g.
A 26-piece set of fish cutlery incl a pair of servers, silver, Reiner Gebrüder Krumbach Germany first half of the 20th C.
12 forks, length 18.7 cm 12 knives, 21.8 cm Servers circa 23 and 27 cm. Silver 800. Total weight approx. 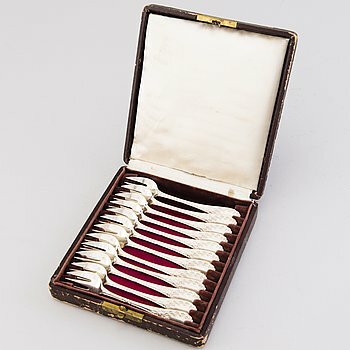 1476 g.
A set of silver cutlery, 77 pieces, "Vasa", GAB, Stockholm 1930s. 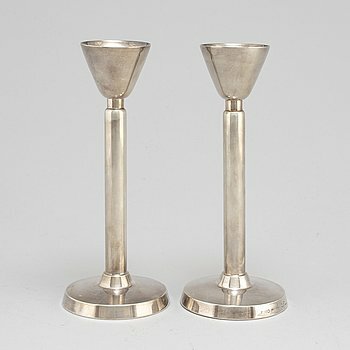 A pair of 20th century silver candlesticks, mark of Gustaf Jansson, CG Hallberg, Stockholm 1958. A Swedish 20th century parcel-gilt vase, mark of Jan Lundgren, Stockholm 1979. Height 14 cm, weight 225 grams. 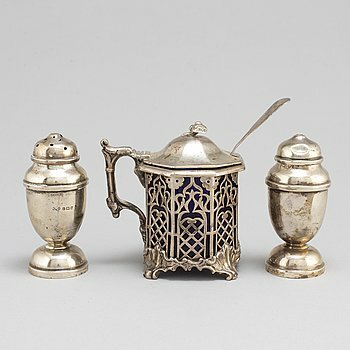 Three Russian silver objects, Moscow and St Petersburg, second half of the 19th century. 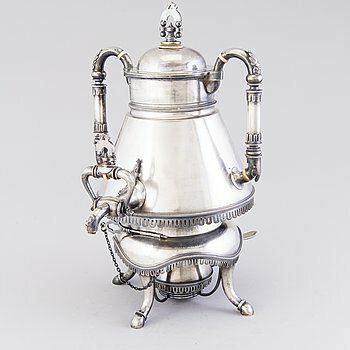 A Swedish 19th century silver coffee-pot, mark of Abraham Edborg, Jonkoping 1845. Height 29 cm, weight 950 grams. 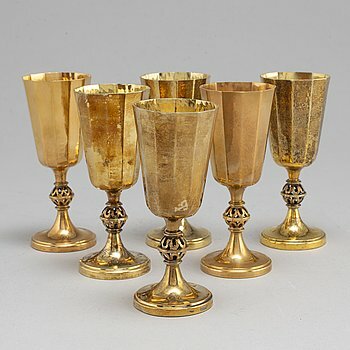 A set of six 20th century silver-gilt beakers/cups, mark of Löfman MGAB, Uppsala 1971-1978. Height 11 cm, total weight 310 grams. 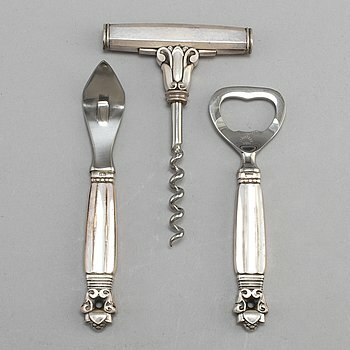 A Danish 20th century set of three Georg Jensen silver openers. "Konge". Length 11-12,5 cm. With box. 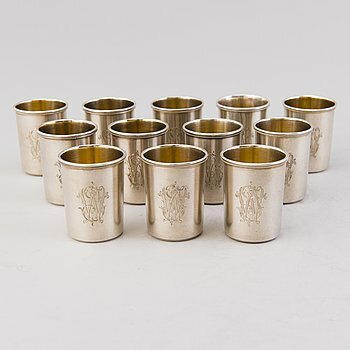 A set of six 20th century silver cups, mark of CGH, Stockholm 1957. Town creast of Malmo. Height 16 cm, total weight c. 1 000 grams. 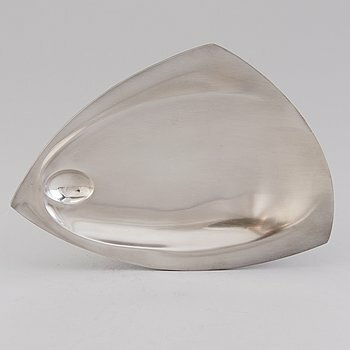 REY URBAN, a sterling silver dish, Stockholm 1966. 30 cm diameter, vikt 789 gram. 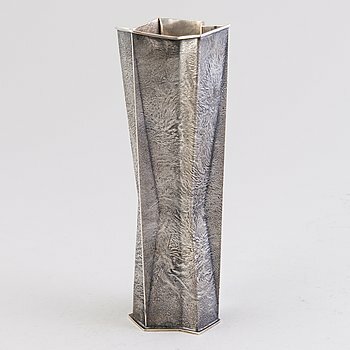 ERIC LÖFMAN, a silver vase, KG Markströms Guldsmeds Ab, Uppsala 1957. Height 12,5 cm. Weight 362 grams. 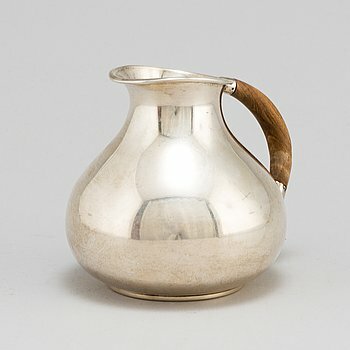 A sterling silver jug, Nordisk Silverkonst, Helsingborg 1948. Height 12 cm. Weight 323 grams. 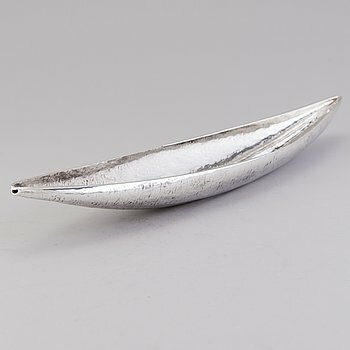 AXEL EDVARD ERIKSSON, a silver and steel weight. Stockholm 1928. Silver weight 20 grams, width 8 cm. Total height 25 cm. 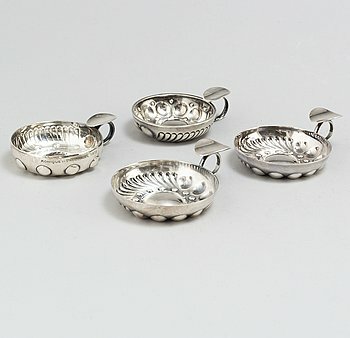 A tray and six cups, silver, Thailand, first half of the 20th century. Tray diameter 30 c, weight 440 g. Cup height 12 cm. 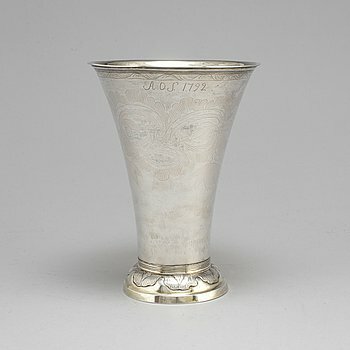 A Swedish silver beaker by Alexander Prytz, Strängnäs 1792. Height 21,5 cm. Weight 404 grams. 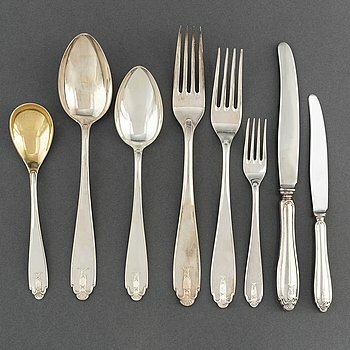 A second half of the 20th Century 48-piece 'Uppsala' silver cutlery service. 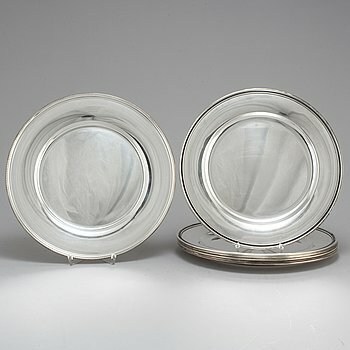 Silver dishes, 6+1, of which six made by C G Hallberg, 1959. Diam 27,5 cm. Weight 2678 gram. 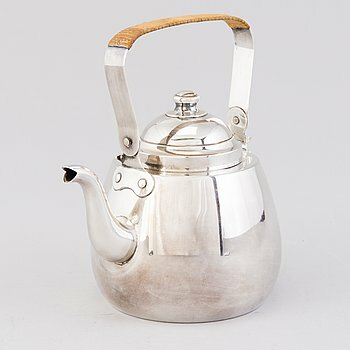 A silver coffeepot, mark of Auran Kultaseppä oy, Turku Finland 1959. Height 11 cm, handle excluded. 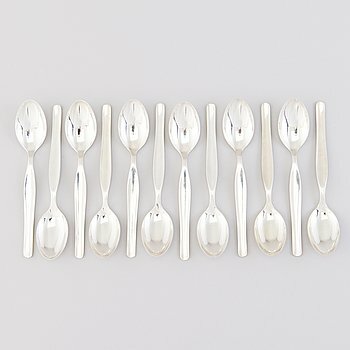 Weight 269 g.
A Set of 12 "Tapio" Sterling silver Coffee Spoons by Tapio Wirkkala, marks of Kultakeskus, Hämeenlinna 1969-70. Length 12 cm. 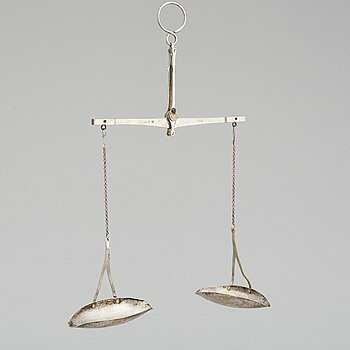 Total weight 162 g.
A SILVER BOW, Germany second half of the 20th century. Length 32 cm. 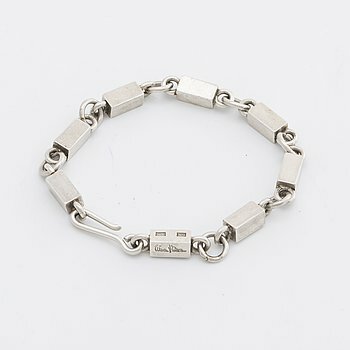 Weight 724 g.
A Swedish 20th century sterling bracelet mark of Wiwen Nilsson Lund 1963, weight ca 25,4 gr. 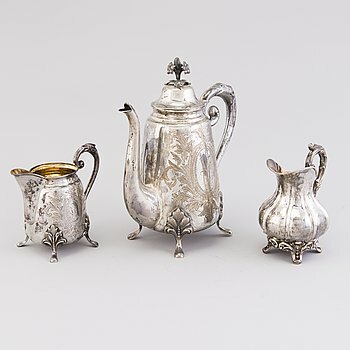 A THREE PIECE COFFEE SET, silver, Turku 1881 and 1883. Height och coffee pot 22,5 cm. 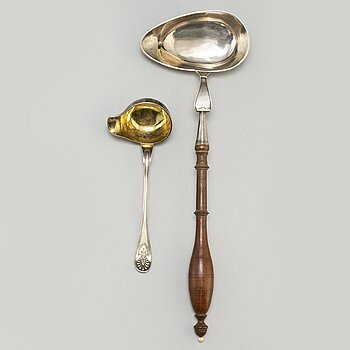 Total weight 771 g.
TWO SPOONS, silver, Moscow ca 1900, Alexandra Yagunova and Stefan Levin, Moscow ca 1881. Längd 19 cm. 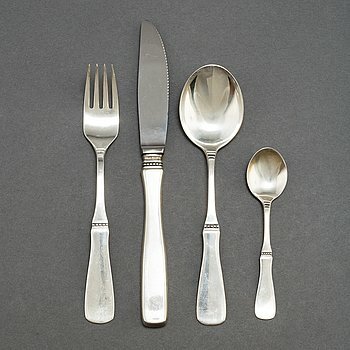 Weight 139 g.
Twelve "Pyramid" flatware, executed by Georg Jensen, Copenhagen, sterling. Length 10,5 cm. Total weight 188 gram. Comes with original box and fabriclad case. 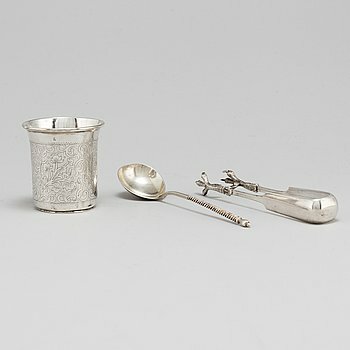 A collection of silver objects, 20 pieces, 20th century. 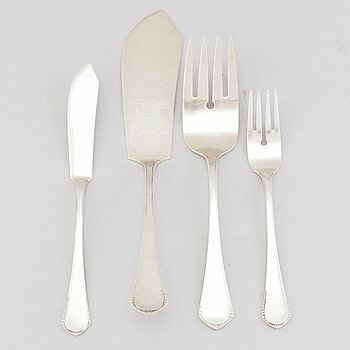 A set of silver cutlery, 66 pieces, "Haga", 1940s. 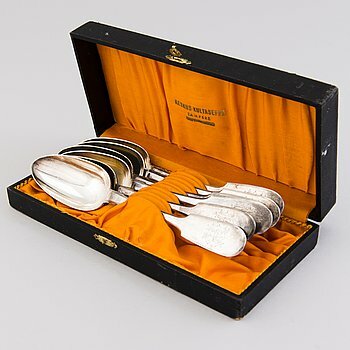 A Swedish 20th century silver 73 piece table-cutlery, marked GAB, Stockholm 1940-/60's. 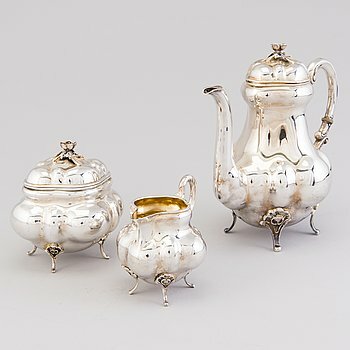 A silver mustard jug and two shakers, England. Height 9-10 cm. Jug and spoon weight 162 grams. 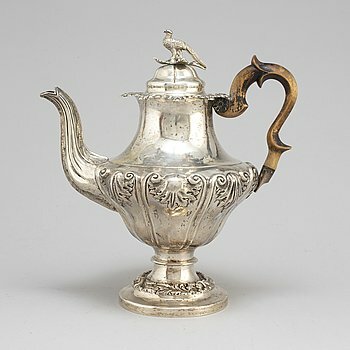 A silver coffee pot, Gustav Magnus Okerblom, Sankt Petersburg, Russa, 1849. Height 12,5 cm. Total weight 296 cm. 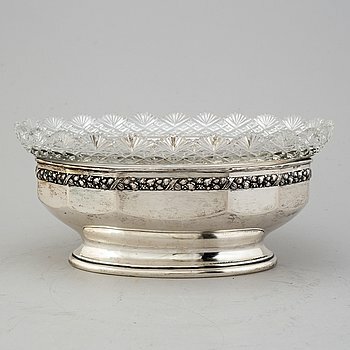 A first half of the 20th Century silver bowl. 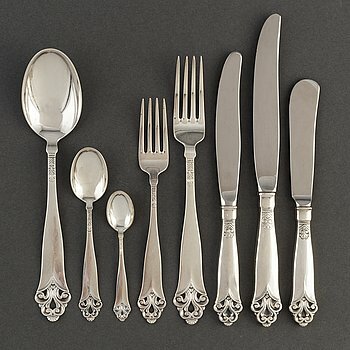 5 psc serving silver cutlery, Germany circa 1900. In original box 35x31x4 cm, weight 416 grams including parts of steel and horn. 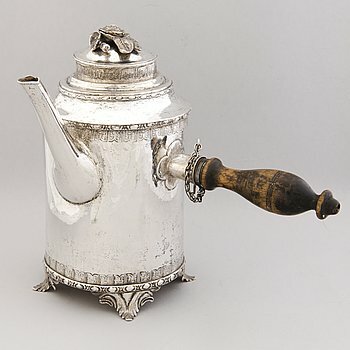 A Swedish 19th century silver coffee-pot, mark of Carl Nystrom, Stockholm 1848. Height 27 cm, weight 590 grams. 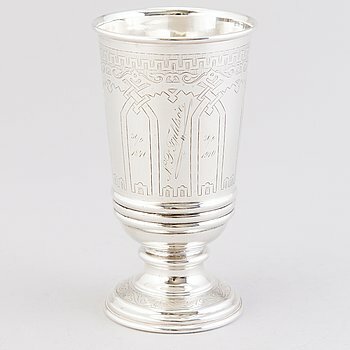 A Russian silver goblet, mark of AM, unidentified, and assay master Ivan Yefimovich Konstantinov 1876. Height 14.5 cm. Weight 198 g.
TAPIO WIRKKALA, Silver vase TW 226, marked TW, Kultakeskus, Hämeenlinna, Finland 1978. Partly samodorok technique. Height 21.5 cm. 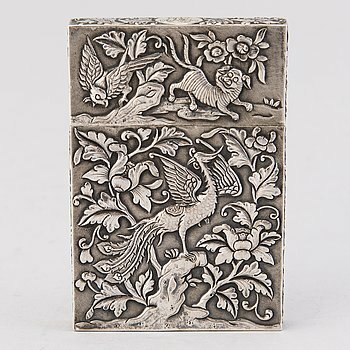 Weight c. 318.7 g.
A Chinese silver box. Control marked by A. Tillander, Helsinki 1938. 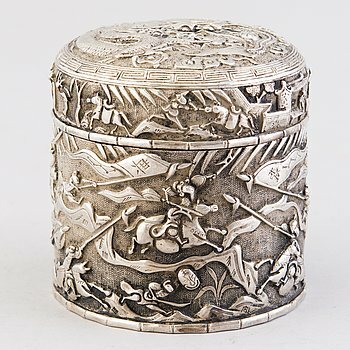 Richly decorated with battle motif. Height 8.5 cm, diameter 7.5 cm. 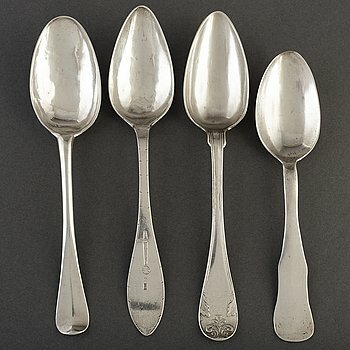 Weight 150 g.
A set of six silver spoons, St. Petersburg, the late 19th century. Length 21.5 cm. Total weight 430 g. In a box. 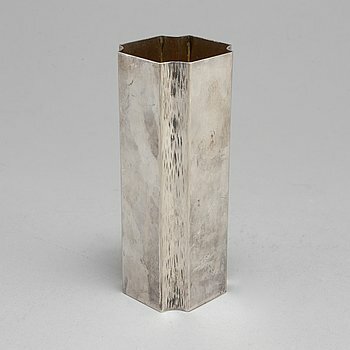 A silver plated candleholder, Erik Nordgren, Jönköping (1817-1847). Width 25. Height 10 cm. 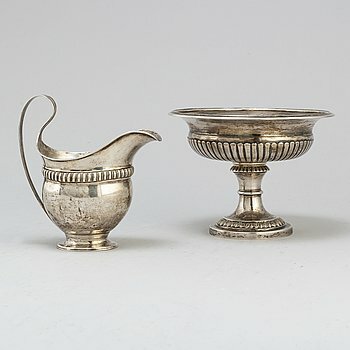 A Swedish 19th century silver bowl and a Danish 19th century silver milk-jug. Bowl marked Cristian Hammer, Stockholm 1852 and jug marked Copenhagen 1822. Diameter 18,5 cm, height 13,5 cm. Jugs height 16 cm. Total weight 525 grams. 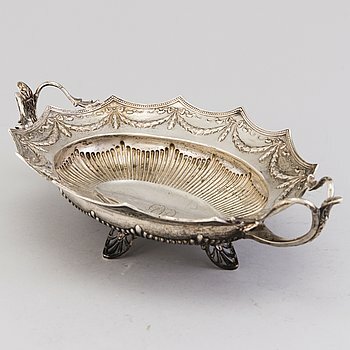 LADDLE, silver, Sweden 1805, SALT AND PEPPER CASTER, silver Birmingham 1890 and 1916. Length of laddle 40 cm, height of casters 7,5 cm. 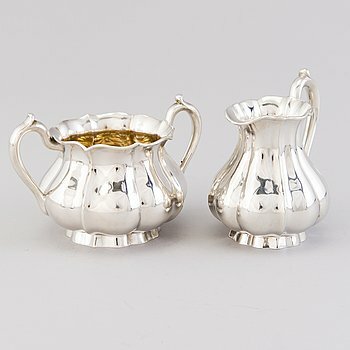 A silver cream jug and a sugar bowl, mark of Bruno Nylund, Helsinki 1924. Gilded interior. Height 10 and 9 cm. 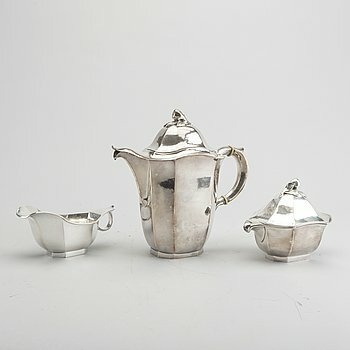 Total weight 310 g.
A 3-piece silver coffee set, mark of Emil Hermann, Waldstetten, Germany 1921-1950. Swedish import marks. A coffee pot, a cream jug and a lidded sugar bowl. The cream jug and the bowl with gilt interiors. Lids with floral branch finials. Height of the coffee pot 20 cm. 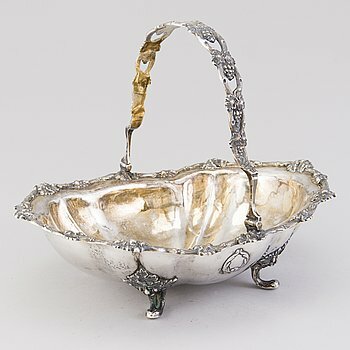 Total weight 678 g.
A parcel-gilt silver bread basket, 20th Century. Gilded interior. Length 21 cm, height 20 cm. 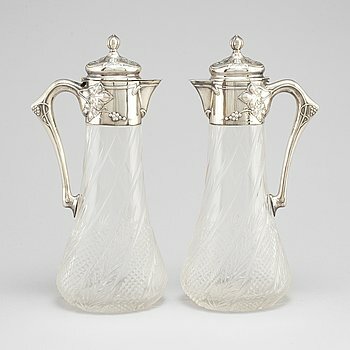 Weight 394 g.
K ANDERSON, pair of silver and glass claret jugs from Stockholm, 1902. KARL ANDERSSON, a silver and glass jardiniere, Stockholm 1913. 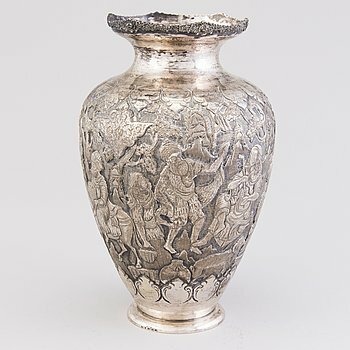 VASE, silver, Persia 20th century. Height 26 cm. 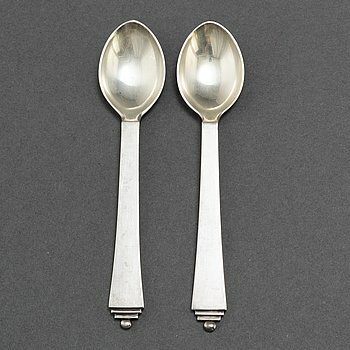 Weight 870 g.
A PAIR OF SPOONS, silver, niello. Moscow, late 19th century. Length 16.5 cm: assay master Apollonovich Artsybashev, mekers mark BA. Length 18 cm: assay master Viktor Savinsky. 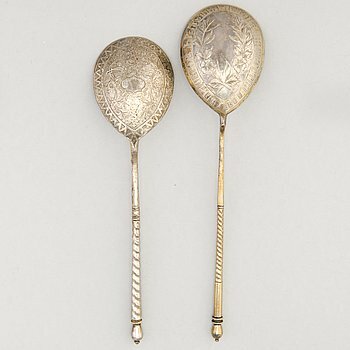 TWO SPOONS, silver, Moscow, 1873 and ca 1900. Engraved decoration, 19,5 och 21 cm. 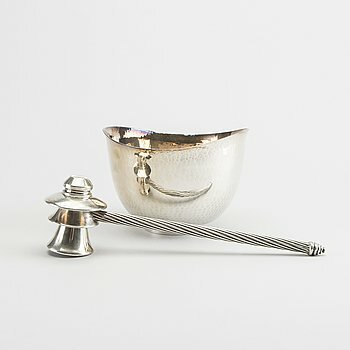 Weight 128 g.
A 20th century silver bowl and gavel, total weight ca 647 gr. 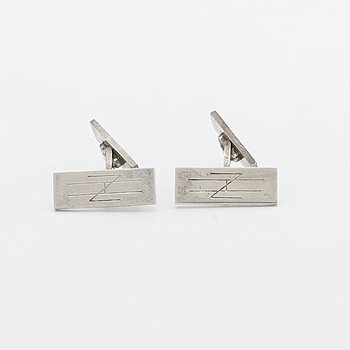 Skål signerad Eric Löfman Uppsala 1979, höjd 9,5, längd 14 cm, vikt ca 345 gram. Ordförandeklubba, ostämplad, märkt "Åt Sydsvenska Kraftbolaget såsom minne af den 7 maj 1909, då elektrisk ström första gången levererades till Malmö Yllefabrik", längd 23 cm, vikt ca 302 gram. 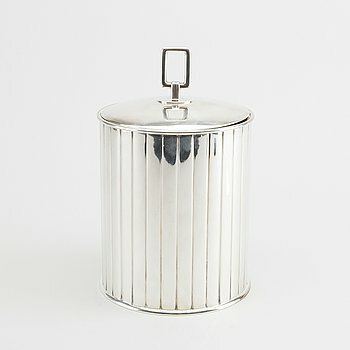 A Swedish sterling can with lid, mark of S Bernadotte for G Jensen Denmark, total weight 1000 gr. 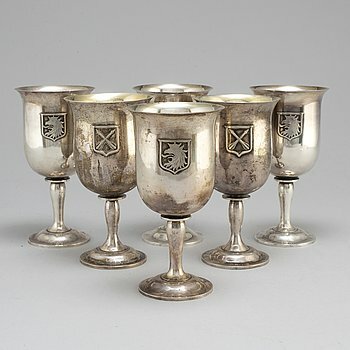 Four 20th Century silver taste du vin. 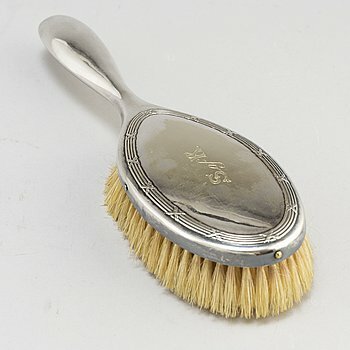 CLOTHES BRUSH, pewter, GAB and a WILLIAM HUTTON & SONS Silver Pin Cushion Box, London 1822. Clothes brush length 23 cm. Engraved monogram. Pin box 8x 8 cm, one side with engraved monogram beneath a noble cronet. 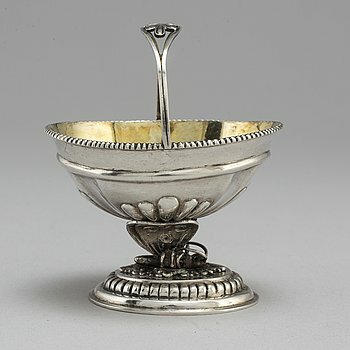 A silver sugar bowl by Johan Bergman Luleå, 1811. TENN & SILVER AB. 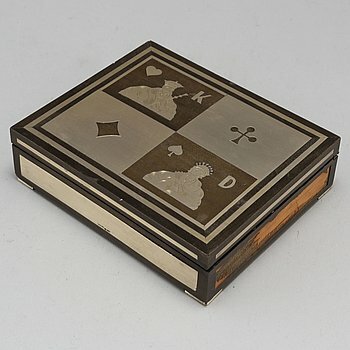 A silver and wood box. Gothenburg 1948. 15 x 18, height 5 cm. 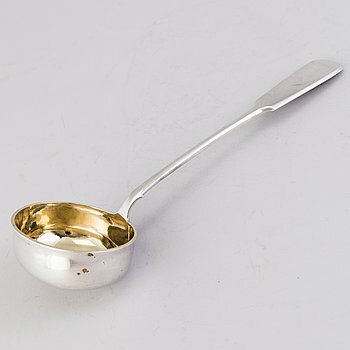 A silver soupspoon and silver saucespoon, among others N.L. Kjellberg, Kalmar 1815. Length 19-37 cm. Weight 205 grams. 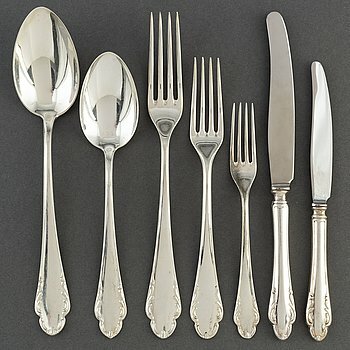 Fifteen (12+3), mid 19th century silverforks. Length 19 and 21,5 cm. Weight 825 grams. 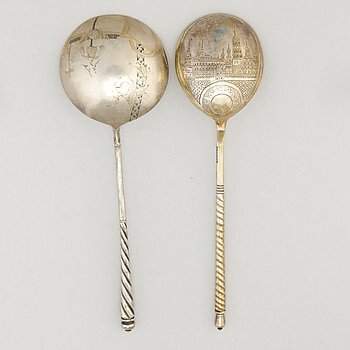 4 silver spoons, 18th/19th century. Among others Otto Wilhelm Kjellberg, Västerås 1840. Length 20-22 cm. Weight 192 grams. 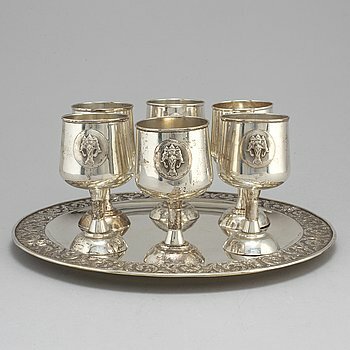 A Swedish 20th century 3 pcs silver coffee service mark of Jacob Ängman Stockholm 1939, total weight ca 949 gr. 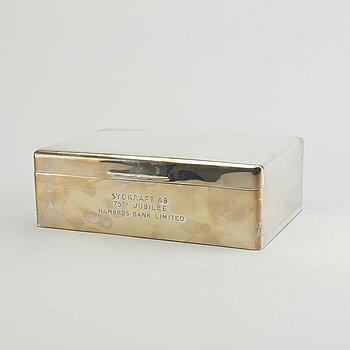 A 20th century English silver cigar box, total weight ca 1500 gr. 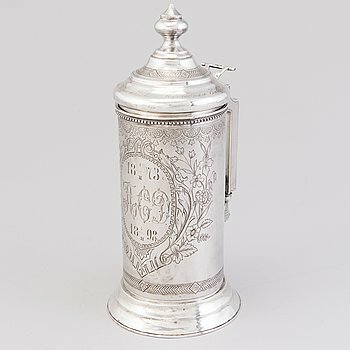 A silver tankard, mark of Vasili Ivanovich Ivanov, assay master A. Skovronsky, Moscow 1896. Height 30 cm. 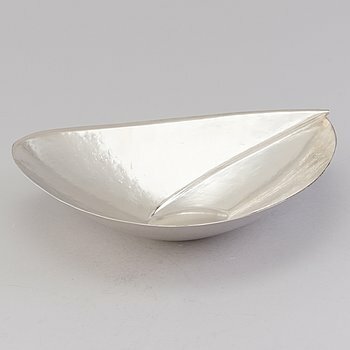 Weight 729 g.
TAPIO WIRKKALA, A silver plate marked TW, for Kultakeskus, Hämeenlinna, Finland 1967. Length 26 cm. Weight circa 271.9 g.
TWELVE BEAKERS, silver, Morosov S:t Peterburg 1894. Height 5 cm. 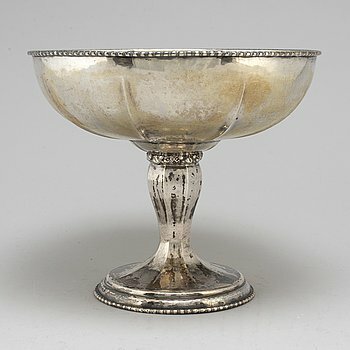 Total silver weight 338 g.
A RUSSIAN SILVER CENTERPIECE, Gratchev S:t Petersburg 1908-17. Nyklassicistiskstil. 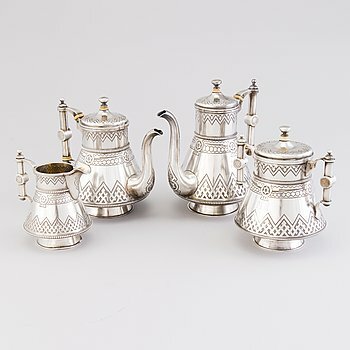 Höjd 22,5 cm, Längd ca 39 cm, vikt 736 g.
A FOUR PIECE COFFEE AND TEA SET, silver, S:t Petersburg, 1885, Gratchev, Johan Olsonius, sugar bowl1881, Karl Albrecht. Russian panslavistic style, Height of the coffepot 21 cm. 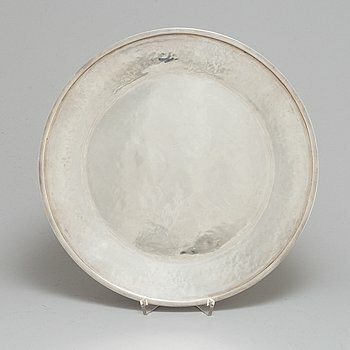 Height of the sugarbowl ca 17 cm, width 15 cm. 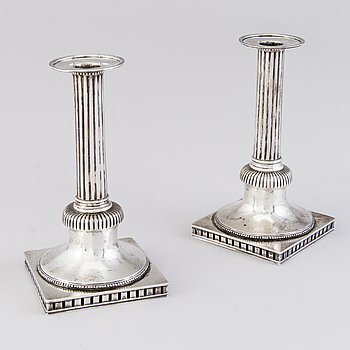 Total weight 2186 g.
A PIAR OF FINNISH CANDLESTICKS, silver, Anders Christian Levon, Turku 1799. 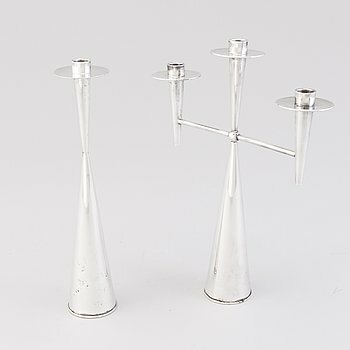 TAPIO WIRKKALA, Candelabrum TW 202 and candlestick TW 189 in silver (916), Kultakeskus, Hämeenlinna 1961. For three candles, height 24.4 cm. For one candle, height 23.5 cm. Both marked 'TW'. 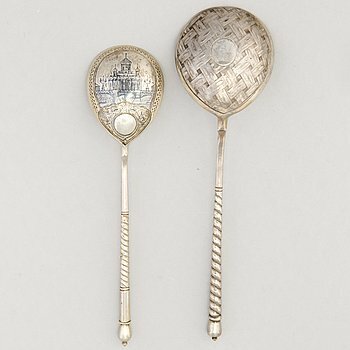 LADDLE, silver, Fabergé, Moscow 1908-17. Length 29 cm, weight 251 g.
TAPIO WIRKKALA, Eight silver beakers for Kultakeskus, Hämeenlinna 1996 and 2008. 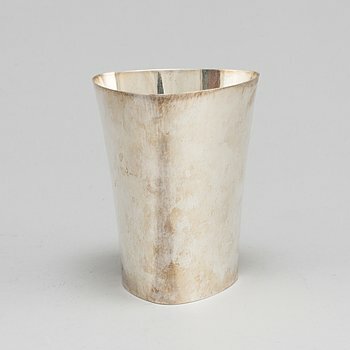 Hammered silver. Mark of TW. Original package. Height 5 cm. Diameter 5 cm. 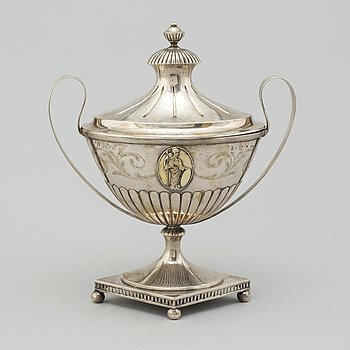 Total weight c. 441.2 g.
A Russian silver samovar by Johan Ferdinand Olsonius, Grachev, Saint Petersburg 1882. Panslavistic style. Height 38.5 cm. 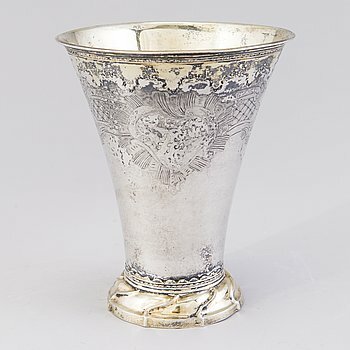 Total weight circa 2923 g.
A LARGE BEAKER, silver, Arvid Floberg, Stockholm 1771. 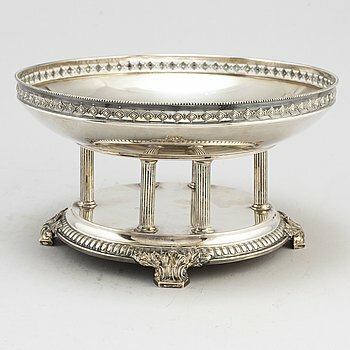 Höjd 19 cm, vikt 424 g.
CARL ADOLF SEIPEL, A parcel-gilt silver fruit basket, assay master Alexander N. Mitin 1857. Gilded interior. Border, handle and feet decorated with grapes and leaves. Length 33 cm. Weight 718 g.
TAPIO WIRKKALA, a (916) silver for Kultakeskus Hämeenlinna 1964. Signed TW. Käsityö (Hand made). Manufactured by order. Lenght 33 cm. Height 7 cm. Weight c. 961.4 g. Originalpackage. 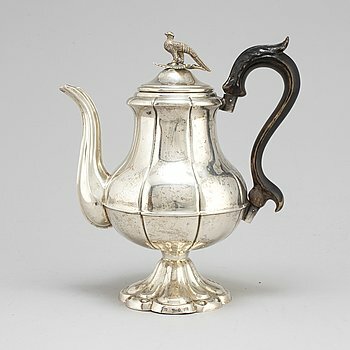 A COFFEE POT, silver. Carl Johan Westrell, Loviisa Finland 1784. Height 21 cm. 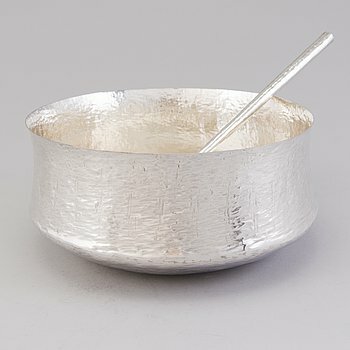 Weight c. 692 g.
TAPIO WIRKKALA, a sterling silver punch bowl and ladle for Kultakeskus, Hämeenlinna 1973. Signed TW. Käsityö (Hand made). Manufactured by order. Diameter of the bowl 26 cm. Height 12 cm. Length of the ladle 36 cm. Total weight c. 1544.7 g. Originalpackages. 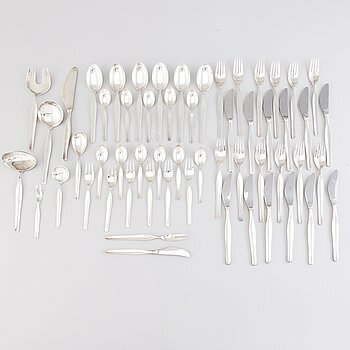 TAPIO WIRKKALA, A 57-piece set of 'Tapio' silver cutlery, Hopea-/Kultakeskus, Hämeenlinna, Finland 1961-76. 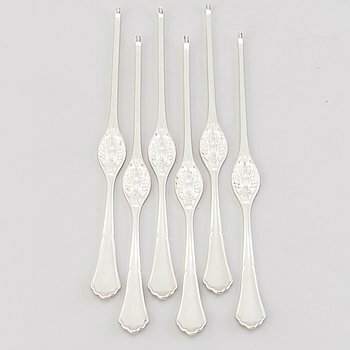 12 forks, length circa 18 cm 12 knives, 19 cm 6 spoons, 18 cm 12 coffee spoons, 12 cm 6 fruit forks, 14.5 cm Serving spoons and forks, a sauce ladle and servers, totally 9 pieces. Weight 1207 excluding cutlery with blades and bowls in steel. 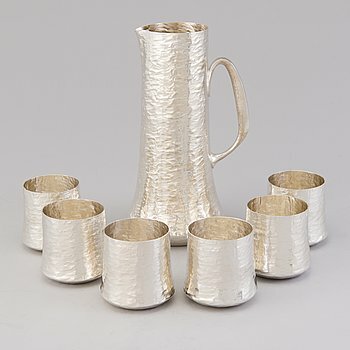 TAPIO WIRKKALA, a sterling silver pitcher and six beakers for Kultakeskus Hämeenlinna 1973. Signed TW. Käsityö (Hand made). Pitcher, height 21.5 cm. Beaker, height 7.5 cm. Total weight c. 1903 g. Originalpackages. TAPIO WIRKKALA, a (916) silver for Kultakeskus Hämeenlinna 1967. Signed TW. Käsityö (Hand made). Manufactured by order. Lenght 53 cm. 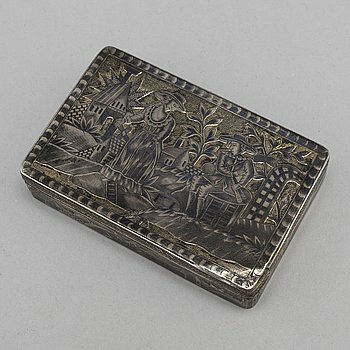 Weight c. 722 g.
CARDCASE, silver, Khecheong, Kiina, Kanton 1850-1870. 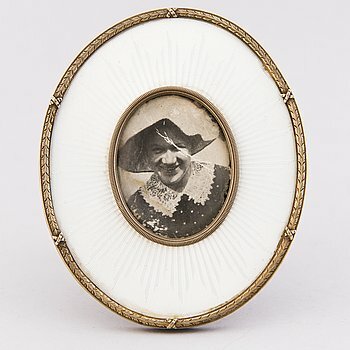 A SILVER AND ENAMEL FRAME, Henrik Wikström, S:t Petersburg 1896-1908. Oval shape with white enamel. Height 8,5 cm, width 7 cm.